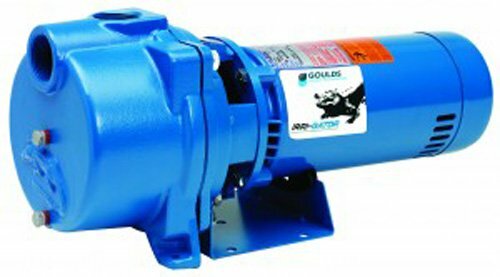 Specifications for the Goulds GT20 Model: • Motor: 2 HP, 230 volt, single phase motor • Pipe Connections: 1-1/2" NPT Suction / 1-1/2" NPT Discharge • MAX Suction Lift: 25 Ft • MAX Total Dynamic Head: 127 ft • MAX Discharge Pressure: 55 psi GPM/Pressure Performance Rating examples for the Goulds GT20: • 20 PSI Discharge Pressure: 5 ft Suction Lift: 86 GPM 15 ft Suction Lift: 70 GPM 25 ft Suction Lift: 46 GPM • 30 PSI Discharge Pressure: 5 ft Suction Lift: 80 GPM 15 ft Suction Lift: 67 GPM 25 ft Suction Lift: 44 GPM • 40 PSI Discharge Pressure: 5 ft Suction Lift: 65 GPM 15 ft Suction Lift: 57 GPM 25 ft Suction Lift: 43 GPM • 55 PSI: (MAX of 127 ft of Dynamic Head Pressure): 0 GPM Goulds GT Series Standard Features: Self-Priming Design: Once pump is initially primed, filled with water, it will re-prime when the water level rises above the end of the suction pipe. Serviceable: • Back pullout design allows dis-assembly of pump for service without disturbing piping. • Two compartment motor for easy access to motor wiring and replaceable components. Diffuser (Guide vane): Bolt down diffuser provides positive alignment with impeller. Diffuser has stainless wear ring for extended performance in abrasive conditions. F.D.A. compliant, injection molded, food grade, glass filled Lexan for durability and abrasion resistance. Impeller: F.D.A. compliant, glass filled Noryl. Corrosion and abrasion resistant. Corrosion Resistant: Electro-coat paint process is applied inside and out, then baked on. Casing: Cast iron construction. Four (4) bolt, back pull-out design. Tapped openings provided for vacuum gauge and casing drain. Powered for Continuous Operation: Pump ratings are within the motor manufacturer's recommended working limits. Can be operated continuously without damage. Mechanical Seal: Carbon/ceramic faces, BUNA elastomers. 300 series stainless steel metal parts. Pump design prevents the seal from running dry. If you have any questions about this product by Goulds Pump, contact us by completing and submitting the form below. If you are looking for a specif part number, please include it with your message.